Home “Michael Myers... Freddy... Jason are all fake! Jack Haddonfield is real.” FRIDAY THE 31st revives a classic US horror genre... FRIDAY THE 31st is both a homage to and a reboot of the terrifying slasher movies of the late 1970s/early 1980s. Twin filmmakers the Greffrath brothers have created a bloodstained urban legend for our times. 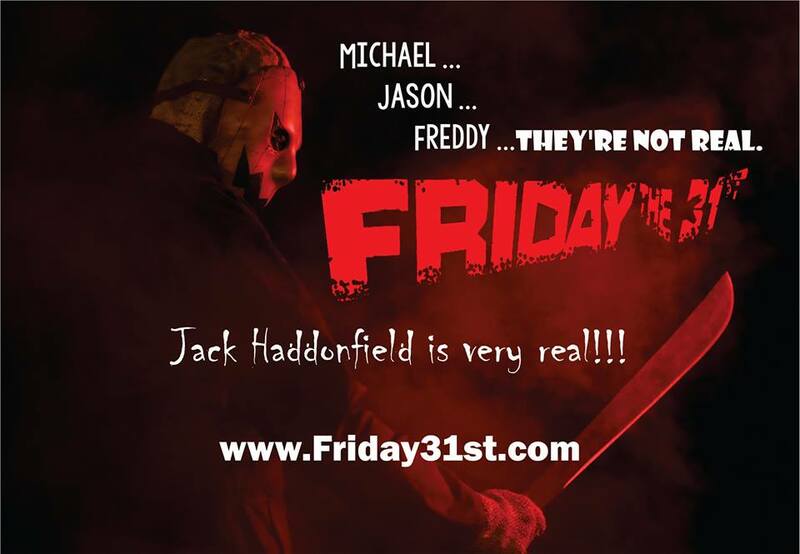 FRIDAY THE 31st is both a homage to and a reboot of the terrifying slasher movies of the late 1970s/early 1980s. Twin filmmakers the Greffrath brothers have created a bloodstained urban legend for our times. Kingston, New York, 07/13/2015 – In the rural environs of upstate NY, twin aspiring filmmakers Christopher and Robert Greffrath have been creating a new horror legend from the dead bodies of its forebears. Not old enough even to have been babies when slasher classics Halloween (1978), Friday the 13th (1980) and A Nightmare on Elm Street (1984) first stalked the screen, they have grown up with these movies much as earlier generations of Americans did with regional folktales. For the story of Jack Haddonfield, ‘the Jack-o’-Lantern Man’, is a campfire tale which comes to bloody, pulse-racing life. Cinematographer Jarek Zabczynski has teamed up with the twins’ independent production company, Greffrath Park Films, to create a trailer which marries the visceral dread of those vintage ‘man in the mask’ movies with the high production values of 21st-century indie film. Clocking in at a menacingly lean 3:37 minutes, the low-budget trailer gives an evocative sense of what will happen if the Greffraths achieve their funding target and Friday the 31st is shot in the Hudson Valley region during the fall of 2015. For this is the season of Halloween – which, as the astute may have gleaned, falls on a Friday during the film – and the concept of F31 takes its cue from John Carpenter’s scene-setting horror classic of 1978. FRIDAY THE 31st requires only a $20,000 budget to maintain the impressive production values promised by its trailer. Hauntingly filmed, briskly edited and set to an electronic soundtrack that provokes all the unease of Carpenter in his heyday, its style is equal parts homage to a horror subgenre – once damned by the critics for its violence, but loved by generations of moviegoers – and also a reboot of that same genre, dragged kicking and screaming into the new millennium.